Digital Content Next (DCN) recently released findings from its second annual DCN Distributed Content Revenue Benchmark Report. The research, written about here and here, provides marketplace intelligence on distributed content strategies and the challenges confronting publishers when working with third-party platforms like Facebook, Twitter, Snapchat, YouTube, and others. The report confirms that despite the constant changes in distributed content policies and business practices, little has changed for publishers in the last 12 months. Facebook and Google generate the most distributed-content revenue for publishers outside of Over-the-Top (OTT). However, together they account for less than 30% of the total distributed content revenue and represent only 5% of the total average digital revenue for publishers. Overall revenues from distributed content grew from 14% in last year’s report and now represent 16% of the surveyed publishers’ digital revenues. Monetization of distributed content for H2 2016 and H1 2017 represented an estimated $10.1 million and $10 million average revenue. For companies providing data for both H1 2016 (last year’s report) and H1 2017 for this report, distributed content revenue grew by an estimated 37% year-over-year. Video, consistent with last year, represents 85% of the total, $8.3 million in 1H 2017, driven by TV/cable companies’ OTT monetization. The remaining 15% cuts across social media, Google AMP and syndication. Facebook generated the most revenue for publishers, capturing $1.3 million (50% of social platform revenue) in H2 2016 and $1.5 million (59% of social platform revenue) in H1 2017. Out of the specific third-party platforms tracked, publishers are active on Facebook, Twitter, YouTube and Instagram. However, for monetization purposes, publishers are still most active on Facebook and YouTube. 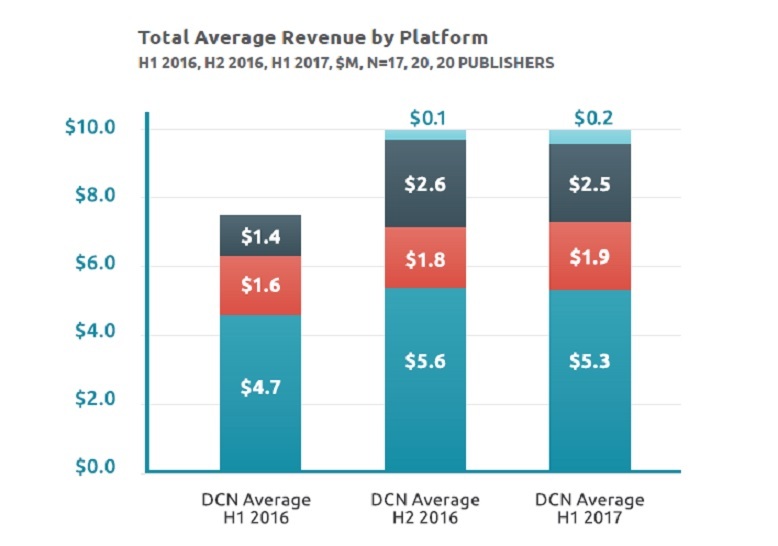 Despite the challenges, DCN found that publishers remain active across a range of channels distributing and monetizing content off their sites at levels relatively consistent with last year’s findings. Still, publishers remain cautious about increasing staffing for distributed content monetization. 1. Concentrate negotiation at the executive level of your company management; do not leave negotiations to lower-level management and/or individual brands or businesses. 2. Focus on products that leverage your core business, are replicable, get new money, and have the potential to scale. and-data for advertising and subscription monetization. 4. Test and measure content consumption and monetization through both advertising and subscription on third-party platforms and compare results to on-site metrics to inform monetization strategies. 5. Centralize responsibilities or use active cross-functional teams for managing third-party partnerships. Advertising is the most common form of monetization of content distributed on third-party platforms, with more than 85% of total average revenue sold directly by publishers. While distributed content remains an essential part of publishers’ strategic plans, the revenues earned do not match publishers’ investment. Importantly, publishers will continue to participate and test to find the best value and revenue model for their premium content.